Editorial Manager of Giramondo Publishing Group. Alice Grundy has worked in Australian publishing for the past seven years.She graduated with an honours degree in English literature from the University of Sydney and a graduate certificate in editing and publishing from the University of Technology Sydney. Her interest in Chinese writers and publishing began when working at Giramondo who have published Sheng Keyi and will be publishing Ye Xin in early 2016. 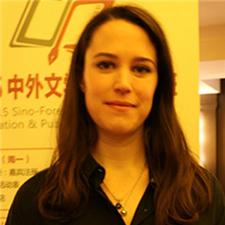 In 2014 she was awarded an Australia Council for the Arts Grant to spend time in China learning about the industry – her hosts were People's Literature Publishing House and Shanghai 99. In preparation for her trip and in the months following she has studied Mandarin at the Centre for Continuing Education, University of Sydney.